“There were 670 recalls in Australia last financial year compared to 596 in the previous financial year. 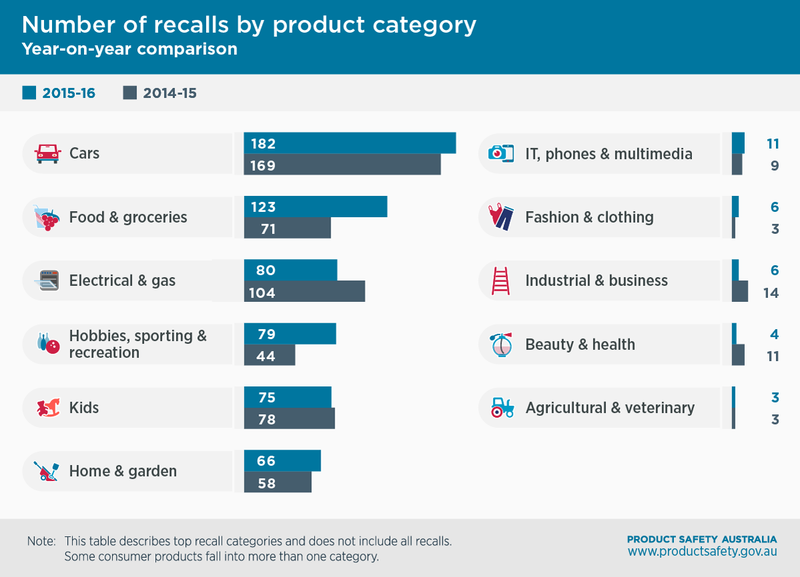 Consumers can easily check our Recalls information to ensure they don’t have any unsafe goods lying around in their homes or garages, and act quickly to remove potentially harmful products from their homes if they have been recalled,” ACCC Deputy Chair Delia Rickard said. “It doesn't matter if you're at home, work or on the go as our new Product Safety site is fully mobile responsive enabling you to keep up-to-date on the latest product recalls and safety information from any device. By following the advice on this site, you can buy and use products wisely and protect yourself,” Ms Rickard said. This year, the ACCC undertook a project to explore what factors may influence recall success. and consumer perception of the risk and hazard of the product. “Our study indicated that the first eight weeks following notification are the most important. During the first six to eight weeks of a recall campaign, over 80 per cent of all products that are likely to come back are returned,” Ms Rickard said. Sign up for email alerts on the latest recalled products. You can tailor the alerts to choose products that interest you. Consumers can report an unsafe product to the ACCC by completing a simple web form to help protect others from harm. The new website also provides consumers with safety education, lists the products that are managed by mandatory safety standards and explains which specialist agencies have responsibility for products that aren’t managed by the ACCC.